Earlier this week, both the New York Times and the L.A. Times published articles on California high-speed rail. The NYT tells the overall story in an informative and fairly balanced way. The L.A. Times continues its long history of misleading high-speed rail articles by Ralph Vartabedian. For Vartabedian’s latest piece, ‘Calculations show bullet train can complete the route within 2 hours and 40 minutes. Reality may prove slower,’ the newspaper used the public records act to request raw data on scheduling simulations from the California High Speed Rail Authority (CAHSRA). These simulations show that CAHSRA has designed its system to complete a two-hour, 40-minute trip between L.A. and San Francisco, which is the trip length approved by voters in 2008. Hmm… Agency promises schedule. Voters approve. Computer simulations show that the designs meet the promised schedule. Shouldn’t this story be about a government agency making good on a pledge? Well, not if it’s the L.A. Times reporting on high-speed rail. There’s a rail vs. cars double standard here. Delivering on pledges is something that California’s freeway-builders routinely fail to do. Caltrans, using discredited Level of Service predictions, repeatedly boasts that its multi-billion dollar freeway widening projects reduce congestion and improve air quality. The Times gives rail projects hell for cost overruns and performance predictions. Freeway expansion projects apparently don’t merit anywhere near the same scrutiny from the Times. Vartabedian, using a playbook common among lazy, biased transit journalists, quotes rail critics such as Robert Poole, a transportation “expert” at the Reason Foundation–which is a ‘think tank’ (that is, a lobby group) funded by the Koch Brothers and ExxonMobile, among others. So, yes, it’s likely that few trains will make it in two hours and 40 minutes. The CAHSRA would probably operate one peak morning train and one peak evening train to get business travelers between S.F. and L.A. in time for morning meetings and then home again for dinner. That’s the letter and the intent of the voter-approved Prop. 1A. But most other trains would make intermediate stops, say in Burbank, Fresno, and San Jose, and a few local trains would stop at smaller stations as well. Those runs would take closer to three hours from L.A. to S.F.–still very competitive with air travel, when one factors in the trip to the airport, delays on the tarmac, etc. Train systems in Asia and Europe that have similar run times have taken huge market share from airports. This is how they operate. The Japanese Shinkansen, the inspiration for all of the world’s high speed trains, operates between Tokyo and Osaka, a distance of 344 miles. The fastest trip takes two hours and 22 minutes, yielding an average speed of 145 miles per hour, according to Japanese Railway schedules. The French Train à Grande Vitesse, or TGV, operates the Paris to Lyon line over 243 miles and takes one hour and 59 minutes, according to TGV schedules. The average speed is 121 miles per hour. These numbers are valid, but let’s get a little perspective. The Tokyo-Osaka Shinkansen, although it has since been upgraded, was originally built in the 1960s. The French TGV line that Vartabedian has chosen to highlight was designed and built in the late 1970s/early 1980s. Why not look at a newer line? Such as, say, the Chinese Beijing–Shanghai high-speed railway, which runs at 220 mph (speeds were lowered temporarily but resumed this top speed last year). The French TGV, in tests, has reached a whopping 357 mph. That still holds the record, set in 2007, for a train on steel rails. Many other rail manufacturers have greatly exceeded the speeds referenced by the L.A. Times. That said, there is a trade-off between how fast a train can go and how much it will cost in electricity and track wear. In order to make higher speeds more economically feasible, rail manufacturers are constantly improving their equipment to reduce weight and power consumption. Off-the-shelf trains already exist that can fulfill that 220 mph speed requirement within the economical threshold of power consumption and weight. China has them, as noted above. There’s also the French Automotrice à grande vitesse, (AGV), which can cruise at 220 mph while consuming the same or less power than France’s current fleet. Manufacturers in other countries also have trains in operation that should be able to handle California’s mandate. Vartabedian also writes that CAHSRA will depend on “human train operators consistently performing with the precision of a computer model.” Well, that’s already done around the world, since high-speed rail trains are basically controlled by computers–the train driver is in the system to make sure nothing goes wrong. In fact, there’s a famous case of a Japanese Shinkansen driver who fell asleep, and the train continued along at 170 mph, eventually pulling itself into the next scheduled station without incident. There is no doubt that the first train to use California’s high-speed track spine in the Central Valley will not fulfill the speed requirements right out of the gate. Opponents of the project seem unaware–or deliberately obfuscate–that high-speed trains can (and do) slow down and use existing tracks. If there’s a criticism to be made of the CAHSRA, it’s that it has not yet spelled out plans for intermediate services that could run while Californians wait for the full build-out of the system. For example, there are tracks–currently used by Amtrak–connecting Oakland to the northern end of CAHSRA’s 119-mile Central Valley spine. High-speed trains could use those tracks–towed by conventional diesel locomotive for part of the trip–to offer a much-improved Amtrak service. That type of stepped approach is how high-speed rail was built in many places. One example is the Eurostar train between Paris, Brussels, and London. 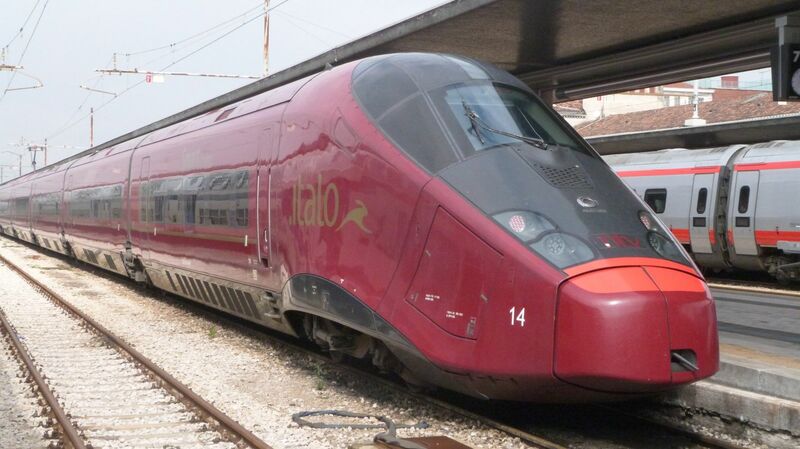 From 1994 to 2007, this high-speed train went around 186 mph from Paris to the Channel Coast. When it popped up on the British side, it slowed to 90 mph or slower, and shared tracks with commuter trains–much as CAHSRA plans to do with shared Bay Area Caltrain service–because the UK originally didn’t want to spend the money to build a dedicated high-speed line to the coast. Specially designed trains could run on both France’s dedicated high-speed lines, which have overhead lines for power, and the UK’s third-rail-powered tracks. The total trip from London to Paris with this ‘blended approach’ took around three hours. Over time, more high-speed segments were built and train speeds increased. The Eurostar now takes about two hours and 20 minutes to do the same trip. And the newest trains go 200 mph. There’s also the Sables d’Olonne service in France, which uses a TGV towed by a diesel locomotive to provide a one-seat ride from Paris, traveling at high speed for part of the trip, and then at low, Amtrak-like speeds on other portions. Vartabedian concludes with a Reason Foundation quote asserting that Florida’s future Brightline higher-speed rail would be a better, cheaper model. Brightline opened in January, expanded in May, and is operating successfully. It’s not news that building a ~100 mph facility is cheaper than a 220 mph one. The comparison is apples to oranges–or perhaps house-cats to cheetahs. Basically, Brightline is running at similar speeds to some of today’s Amtrak lines–albeit with more up-to-date trains both inside and out. But the difference is true high-speed trains are transformative–on most corridors in Europe and Asia, airplanes are now the discount, low-ball way to travel, because high-speed rail has taken over the business market almost entirely. Perhaps that’s why an oil-backed group such as Reason is willing to throw a bone to Brightline–it’s nice, but it’s no threat to the dominance of petroleum-dependent, heavily subsidized transportation (mainly cars and airplanes). Back to this week’s other HSR article, the New York Times ‘A $100 Billion Train: The Future of California or a Boondoggle? ‘ by Adam Nagourney. If you only read one high-speed rail article this week, we recommend the piece in the NYT, which paints a much more balanced picture of a project that has faced a lot of adversity, but is getting built anyway. Nagourney’s piece includes plenty of project criticism. He quotes former Fresno mayor, now state assemblymember Jim Patterson, as saying “This is going to be the most expensive and slowest form of fast rail imaginable.” This is just hyperbole from someone who has always opposed the project. There’s no way that California’s high-speed rail will be the “slowest” anything. Approximately two dozen other countries have found HSR feasible, including Uzbekistan… there is no reason it can’t be done here. California already bought new locomotives and a new passenger car fleet is on order. The Feds might also take issue with running (relatively) light-weight DMUs on freight tracks. Leasing use of freight tracks, with limited slots is one of the major reasons for slow and infrequent service. The exact type of train doesn’t if they only have a few slots on track freight companies have no incentive to improve just for passenger service. You might find the State Rail Plan interesting. California has no reason to electrify trackway they don’t own. The flipside of that is all new rail infrastructure be electrifiable, like purchasing the extra properties for the future installation of poles. Sure, you can use diesel-electric and/or dual-mode locomotives as an interim solution until a line is electrified but the long term plans should be to electrify all heavily used freight and passenger lines in this country. And in lieu of buying new locomotives it might make more sense for a passenger line to buy DMUs for the reasons I stated earlier. Only in this country is service with frequent stops operated by locomotive-hauled trains which can’t get out of their own way. DMUs can bring a significant schedule reduction with no investment in the infrastructure at all by virtue of their rapid acceleration. It sounds like you would have no intermediate or short-term reliability and service improvements which can be achieved by replacing aging locomotives which are due or over-due for replacement anyway? That’s certainly an exaggeration. We can see in Caltrain exactly what it looks like to keep using 1980s locomotives while waiting for completion of the electrification project which started in 1999. The oldest locomotives are the least reliable, and even though Caltrain has purchased newer locomotives, it just takes one breakdown to bring all the trains behind to a stop. Calfironia’s statewide rail plan calls for using contemporary diesel/electric-hybrid locomotives to provide better service on existing corridors, but all new passenger rail corridor construction would be required to be electrification ready. That means securing the additional property for all the infrastructure, planning where substations will go, etc. Caltrain’s an example of a line which definitely should be electrified, if for no other reason than the Transbay Terminal is a subway station where the exhaust would be trapped. That’s true but rather irrelevant. If there ever is a new trackway built through the Northeast Corridor, it will probably be elevated above freeway medians. That’s all true but the fact is electrification pays for itself except on lightly used branch lanes. We wouldn’t be electrifying for what might, at least at the start, be only a handful of passenger trains daily. Rather, the electrification would be to make freight operations more cost effective. You get electrified passenger trains as a bonus. There’s a reason most railroads elsewhere are electrified. There’s a real long-term cost savings to doing so. You can also get more trains over the line, whether they’re freight or passenger, by virtue of the higher speeds/greater acceleration enabled by electrification. Finally, if we’re talking passenger trains which are short enough that a diesel locomotive can give them near-electric performance, that type of service is better done via DMUs. You can tailor the train length to match the passenger load. You get the same acceleration performance regardless of train length. We just need to revise the silly FRA rule which considers each DMU or EMU a locomotive for inspection purposes. Tha’ts probably what’s holding back their wider use in this country. There was no reason for the state to pursue a statewide air travel network expansion plan once it proved impractical because there is still going to be growth in air and road travel even with high-speed rail. Once we decided on high-speed rail, the approach to the airports swung towards dealing with their own needs and providing connectivity to high-speed rail. There’s a reason the only HSR stop between San Francisco and San Jose (connection to SJC) is in Millbrae (transit hub connecting to SFO) and the airports endorsed high-speed rail because every shuttle flight they can offload to a train is space for more long-haul flights (more profitable to SFO) and flights within the state or the coast to areas not covered by HSR. The airlines which operate those shuttle flights don’t see the same, but I wonder if it just means there will be more flights to Seattle, Portland, San Diego, etc. You might have noticed the State has still be expanding roads even with High-Speed Rail limping along. For the many lines and systems which do not need the full power of an electric locomotive like the ACS-64, the current generation of diesel/electric-hybrid locomotives provides performance close enough to electric trains the lower horsepower is a completely reasonable compromise to make given the time and cost required to fully electrify a line before any electric service can start. That figure is just the Authority being more conservative…and indicative of the realities of financing schedules. All of the bids for CPs have come in under-budget, and none of them have come anywhere close to blowing through their contingencies. Most of the cost increases are from scope enhancements, which does *not* qualify as a cost-overrun in my book (unless you’re the LA Times). Then we’re making the same point? I was just adding that this is part of their business plan — and largely has been since the beginning, which is why the IOS was built in the CV (and why all of the “WHY START IN THE CV? IT’S IN THE MIDDLE OF NOWHERE” news articles were dumb). If anything, Amtrak (or DB, as the early operator) can operate Brightline-/Acela-like service(s) utilizing the CV segment. Even without the Madera-Gilroy-San Jose connection, LAUS to Stockton (with the time-savings from the IOS) would greatly improve services. In any case, I believe the ability of the Authority to finance future construction against revenues is greatly underestimated (even the Authority is being conservative on this in their business plans). Don’t waste money on the Hyperloop! Teleportation transmitters are only a single quantum breakthrough away! I felt other commenters had sufficiently broken down the deficiencies in the NYT article, so I didn’t. But you are right that any comment is made persuasive by citing evidence for one’s views. I had done so elsewhere (at the NYT site) but neglected to do so here. To wit: the NYT reporter quoted extensively from conservative policy analysts (Stanford) and Republican politicians (e.g. Fresno) against HSR, but there were only a couple of token pro-HSR comments from joe-everyman commuter, not any experts. For a Streetsblog editor to swallow that NYT article whole seemed obtuse to me, and still does. I’m sitting here sweating in an office in Berlin currently with 8 others. Three of us took HSR into work today. Two took commuter rail and the other three live near the office and took the S-Bahn. Not a single person drove. One is driving this evening to go to Ikea. It’s nice you drove in Europe. In the cities, very few do. If you ever come back, please leave the car behind and enjoy the freedom. The Siemens Charger has a maximum of 3900 HP at the rail. Compare to 8600 HP short term, 6700 HP continuous for the ACS-64. Moreover, the ACS-64 weighs over 22 metric tons less. The ACS-64 would wipe the floor with the Charger in any hypothetical drag race. This perfectly summarizes the main blind spot typical among all Republican voters today. It’s the most frequent Fox News and Koch Brothers funded right wing think tank propaganda talking point that is shoved down the throats of their audience daily. LazyReader (an apt pseudonym) apparently forgot to add the cost of carry on and checked baggage to the airline ticket price, as well as the cost of transfers to and from the airports. I wonder if it is because he hasn’t flown since before 9/11, or because he needs to cherry pick and make misleading comparisons in order to “win” his arguments? You neglected to specify how this article is “so off the mark”. In place of substantiating your charge with evidence or reasoned arguments, you substituted an ad hominem – questioning the editor’s intellect and judgement – and then made a bizarre accusation that the editor has no “commitment to reading what he’s writing about.” To the contrary, the authors come across as quite well read and knowledgeable about the subject matter they are writing about. In fact, your superficial unconvincing criticism of the article is so off the mark and contradicted by the content of the article, one could even legitimately question whether you even read the article. Rather, your simplistic one line generalized swipe could easily be a standard boiler plate attack against any article of any subject whatsoever, even ones you’ve never read, and nobody would know the difference. Circumstances will differ, but the Siemens Charger (GE has an equivalent) diesel/electric hybrid locomotives offers electric-like performance (faster start and stop times) up to 125mph speeds without all the electrification infrastructure. I agree energy companies don’t need subsidies. But the subsidies are negligible considering the Trillions in value they produce, I don’t see it as a subsidy, more of a tax return. And oil companies pay more in taxes, they have to pay local, state, national and whatever country they do business in, by the end of fiscal quarter about 50-70% of their revenue goes to the government. Most of the subsidies to oil are aimed at consumers, not the companies themselves. During the Obama years from 2010 through 2013, federal renewable energy subsidies alone increased by 54 percent—from $8.6 billion to $13.2 billion and the industries he subsidized still collapsed. 1. Food – no more synthetic fertilizers, fungicides, pesticides and herbicides. Back to using manure. Expect crop losses of 40-80%. And E-Coli and food borne pathogen infections to return to pre-industrial levels. 2. Plastics – gone. Cant manufacture long chained hydro-carbons without their pre-cursor short chain hydro-carbon. NO PLASTIC, what will IKEA makes it’s furniture from. 3. Modern Medicine. About 85% of modern pharmaceutical drugs use Benzene as a pre-cursor. 4. Lubricants – both machine and and personal hope you like it raw, without long lasting high efficiency lubricants nothing runs. Not trains, planes or automobiles or any moving machinery. 5. Steel and all other metal alloys. They require petroleum or coke. 6. Synthetic materials, nylon, spandex, polyester, kevlar, dacron, Mylar, Orlon, Tyvek, Nomex, Qiana, Corfam, and Corian, Polyethylene Terephthalate,Polyethylene, Polypropylene, Polystyrene, Vinyl and rubber. No more LuLu Lemons or running shoes for you and no more bike tires, we all know how Europeans love to bike. 7. About 20% of all construction materials contain or use petroleum products. Without glues, sealants, epoxies, insulation and flame retardants, your house would be a falling apart, leaky, cold, fiery deathtrap. There goes your house. And without oxygen fuel welding or steel mentioned above, nothing above three stories can be built unless it’s stone or brick…….which you cant do since brick has to be FIRED and no stone unless you live near a quarry or pay to have tons and tons of it shipped to you. 8. Flying and shipping. Yeah, lets go back to wooden sailing ships that took weeks to cross oceans. 9: Refrigerants. Yeah, hydrocarbons being used to keep food with short shelf life fresh, without preservatives organic goodies rot in 2-3 days. 10: You can also stop promoting your city as a tourist destination. Think of all the fuel saved by people not going there. I love (I love) the way you keep using the Megabus example to back up your argument that buses have made passenger rail obsolete. Especially since you pretend to be oblivious to the fact that Megabus suffers from the same fatal flaw that you assert will doom HSR: the last-mile problem. In the past five years Megabus has shown that they are capable of attracting a couple hundred riders per day, thus capturing approximately 0.5% of the long distance market between the LA and SF area. Kudos! Now what can they do to expand on this market share and serve a truly significant share (e.g. the 20% share targeted by HSR)? Do you expect to attract significantly higher ridership if Megabus is converted to automated “high-speed buses” and are allowed to operate at 80-90 MPH on I-5? Will you lobby to support converting one lane of all freeways to be used exclusively by these and other automated vehicles? Maybe you think that lowering Megabuses price point from $1 to $0.25 will quadruple the ridership demand. It’s obvious that you’re a captive of your political ideology, and incapable of admitting that there are some areas where private enterprise can’t provide what society needs, and that’s where we need to rely on the government to look for solutions. Actually, I think it’s more like the overall mode share for auto travel should only be 30 to 40 percent in suburban areas. In urban areas you can get by walking, cycling, or taking public transit for virtually all trips. As e-bikes become mainstream, they can largely replace most car trips in cities which might be too long to consider biking. The exception might be trips outside the city. However, with for-hire AVs coming I feel the majority of urban residents will feel it’s not worthwhile going through the expense of owning a car for those once or twice a month trips. That should free up a lot of space currently used to store seldom-used cars. Speaking of that, one measure of transportation efficiency is vehicle utilization. Private automobiles have by far the worst utilization rates of any type of transportation. They sit unused at least 23 hours per day on average, often close to 24. If need be, have a few family members shop together, each with their own shopping cart. Combined they can carry home as much food as you can in a car. Cargo trailers and cargo bikes are another answer. The supposed reason people often give for doing infrequent, big shopping with a car is the savings by buying in bulk. The problem with that reasoning is any savings is more than eaten up by car expenses. Not to mention if you stick to buying mainly sale items at local stores you don’t end up spending much more than going to these big box stores. That’s what I do. When something is on sale that I know I will use a lot of, I buy a few months worth. Don’t forget the subsidy of our socialized parking policy. (There, I’ll say it “socialism”.) Our cities require developers, both residential and commercial, to provide an outrageous number of parking spaces for every land use. These parking requirements reduce property values, and in urban areas the hidden cost of these parking policies is at least $1-2,000 per vehicle. Unfortunately, since these costs are hidden, everybody has to pay them regardless of whether they own a car (i.e. when I ride my bike to the grocery store, I still have to pay for the overhead that the store charges to provide a parking lot that fills up twice a year). This socialistic policy makes it virtually mandatory to own a vehicle if you are able to drive. Changes are coming soon to even human-driven cars. Two years ago automakers representing more than 99 percent of U.S. light vehicle sales agreed that by September 2022 their vehicles will come with automatic emergency braking. That includes systems designed to prevent crashes in which drivers do not apply the brakes or fail to apply enough braking power to avoid a collision. The Insurance Institute for Highway Safety, a group that helped reach the voluntary agreement with automakers, has said as many as 20 percent of crashes could be prevented by the technology. The actual autonomous vehicles react faster than humans, and should reduce accidents by better avoiding getting into them. Those factors add up to fewer traffic jams caused by accidents. Also AVs in small studies as well as simulation have also been shown to even out traffic flow even mixed with human drivers.